A disentanglement puzzle is a type of mechanical puzzle that involves disentangling one piece or set of pieces from another piece or set of pieces. The reverse problem of reassembling the puzzle can be as hard as - or even harder than - disentanglement. There are several different kinds of disentanglement puzzles, though a single puzzle may incorporate several of these features. a closed or nearly closed ring or a similar item. The plate as well as the ring are usually made from metal. The ring has to be disentangled from the plate. Wire puzzles consist of two or more entangled pieces of more or less stiff wire. The pieces may or may not be closed loops. The closed pieces might be simple rings or have more complex shapes. Normally the puzzle must be solved by disentangling the two pieces without bending or cutting the wires. 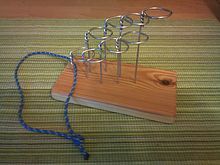 Early wire puzzles were made from horseshoes and similar material. A complex disentanglement puzzle. The goal is to free the string. one piece of string, ribbon or similar, which may form a closed loop or which may have other pieces like balls fixed to its end. sometimes additional pieces like wooden ball through which the string is threaded. Closed string subgroup: Here the pieces of string consist of one closed loop. Usually the string has to be disentangled from the wire. Unclosed loose string subgroup: Here the pieces of string are not closed, and are not attached to the wire. In this case the ends of the string are fitted with a ball, cube or similar which stops the string from slipping out too easily. Usually the string has to be disentangled from the wire. Sometimes other tasks have to be completed instead, such as shifting a ring or ball from one end of the string to another end. Unclosed fixed string subgroup: Here the pieces of string are not closed, but are somewhere on its length attached to the wire. In these puzzles the string is not to be disentangled from the wire. One possible task may be to shift a ring or ball from one end of the string to another end.